14 weeks ago, fifteen new celebrities took to the floor for a brand new series of one of our favourite TV shows, the BBC’s Strictly Come Dancing. And on this here blog, we launched #StrictlyLiveBlogging, our weekly live blog of all the dance twists and turns as they happened – and you’ve read along in your thousands. Now, fifteen couples and twelve dance offs later – just four remain: Gemma Atkinson and Aljâz Skorjanec, Alexandra Burke and Gorka Marquez, Joe McFadden and Katya Jones, and Debbie McGee and Giovanni Pernice. And by the end of tonight, we will know who joins Natasha and Brendan, Jill and Darren, Darren and Lilya, Mark and Karen, Alesha and Matthew, Tom and Camilla, Chris and Ola, Kara and Artem, Harry and Aliona, Louis and Flavia, Abbey and Aljâz, Caroline and Pasha, Jay and Aliona, and Ore and Joanne, as the next glitterball trophy victors and write their names into Strictly history. Our special hour long warm up gets underway at 5:30pm, where we look ahead to tonight’s grand final, and bring you our top 5 dances of the series, before we go live for the last time this year with the show on BBC One. There’s no results show tomorrow, so this is your last chance to get a fix of Strictly on this here blog for the year. 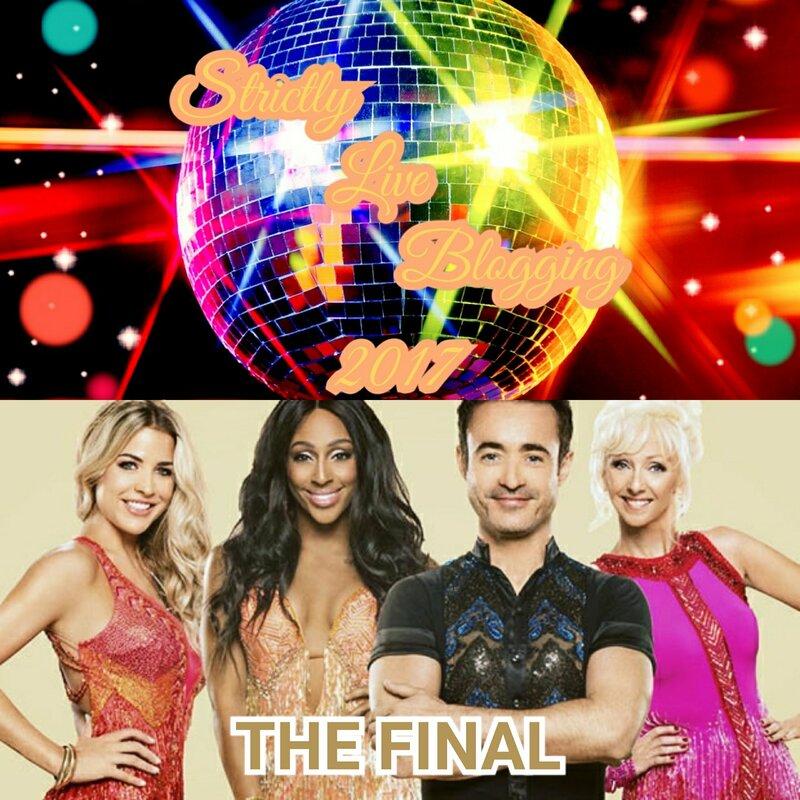 Don’t forget as always to comment below with your thoughts or Tweet us using the hashtag #StrictlyLiveBlogging – let us know who you’re voting for! It’s time for the final live blog this series of #StrictlyLiveBlogging. We’re ready – are you? We want to know from you tonight who’s got your vote – comment below or Tweet us at the link above and let us know! Plus, if that wasn’t enough, the biggest music star of the year, and the favourite for this year’s Christmas number one, Ed Sheeran, is performing his new single ‘Perfect’ live in the studio – here he is with Tess Daly earlier on! FYI, we SOOO want to be a Strictly glitter sweeper. Jus’ sayin. Time now, as promised, to bring you our top 5 dances of this series of Strictly 2017. First up, at #5, it’s the first ever feminist Samba in Strictly history (and the first themed around Wonder Woman at that) – take it away Susan and Kevin in Week 3! This one almost certainly had wings! At #4 in our top 5 dances, from Blackpool Week, it’s Mollie and AJ’s Charleston! At #3 in our top 5 dances of the series, let’s go back to a couple of weeks ago to finalists Joe and Katya’s brilliant Quickstep! At #2 – a storming Paso Doble set in a graveyard from Halloween week from Aston and Janette! But at #1 in our top 5 dances from this year’s series – it’s another Movie Week gem, as Aston and Janette became Trolls for their terrific Cha Cha Cha! 5 minutes to go! Tess and Claudia are ready…are you? Here we go people! Don’t forget as well to Tweet us or comment below if you’re having a Strictly final party! Hold up. Alexandra has a TV in her oven? How is this possible? Such a camp opening number but a brilliant one to boot! Here they all are – your Strictly finalists 2017! Well Alexandra’s costume is better than it was when she first did this dance. In fact everything generally is a bit better about this. I can see this getting some 10s I think! Our Score: 9. Very lover-ly indeed! Shirley said she captured the essence of everything the Strictly final is about and that is was feminine, soft and exquisite. Bruno said it was lovelier and more fragrant than ever and that she always gives heart and soul to every dance. Craig said he couldn’t find a single thing wrong with it. Darcey agreed and said how she creates a narrative with her steps is her greatest strength. Total: 40 – first perfect score of the final! Debbie and Giovanni are next with their judge’s choice dance – how will they do doing their Salsa again? Giovanni’s reading at the start of this is still unintentionally hilarious. DEBBIEEEEEE!!! Again though, perhaps even better than it was first time around. Better arm lifts, better execution. And yet we’re not blown away. Our Score: 8. Good but that’s all there is! Bruno said she defies all the laws of physics and dances like a 20 year old. Craig said he loved the lifts and that they were spectacular. Darcey said the chemistry was to perfection throughout and wants to bottle up Debbie a bit! Shirley said she better focus and she made everything much better and it was fantastic. Gemma and Aljâz are next to dance their judge’s choice again – will their Paso Doble to Coldplay play well again? Well I absolutely loved this one when they did it in Week 4 – and this is just as brilliant if not more so than I remembered it! The intent and focus Gemma gives here is unbeatable. Aljâz’s choreography is brilliant too! Our score: 10. This is when Gemma and Aljâz rule the Strictly dancefloor! Craig said her focus and intent was fantastic and that the dance really suits her frame. Darcey said she was on fire and that the determination and drama was well held throughout. Shirley said she got the shaping she was after and more and that she has mastered her craft. Bruno said she has taken the bulls by the horn and really led the dance and that it was fierce and powerful! Last of the judge’s choice dances now for Joe and Katya – will they dazzle again with their Dr Zhivago inspired Viennese Waltz? I did love Joe and Katya’s costumes in this dance – brilliant still all these weeks later! So graceful, so elegant and romantic. And a real winter warmer with all the cold weather we’ve had this week! Our Score: 10 – from Russia to Vienna with love! Darcey said he rose to the challenge and excelled with wonderful glide and posture and that it was one of her favourites of the series. Shirley said it was big, bold and beautiful and that she’d mark him an 11 if she could. Bruno said he was in love all over again with the dance and that the storytelling in it was so beautiful! Craig said it was a no nonsense proper Viennese Waltz and he loved it! I think Alexandra should have kept the green dress on to be honest. The musicality is well captured in this but I’m not that excited by this to be honest! Our Score: 8. But hey, that’s showbiz! Shirley said it was fun and bright and really made use of the space and that she really came into her own. Bruno said she was Top of the Pops making hit after hit with her show dance. Craig said she has a wonderful, natural ability that oozed out of the dance with lots of surprises throughout. Darcey said her extraordinary versatility was well demonstrated and that she was a real artist. I’m reminded somewhat of 2012 finalist Kimberley Walsh’s version of this song when she danced with Pasha in the video to this. Quite graceful and fluid! And…she’s just done the splits! Our score: 9. She’s flying high with this show dance. Bruno said she flew like an angelic creature and that she danced and moved beautifully like a dream. Craig said it was dangerous to do classic ballet in front of Darcey but she pulled it off well and he enjoyed it. Darcey said she is perfectly petite and that she magical sparkle that partners Giovanni perfectly. Shirley said it was quite emotional and it has shown her growth from the beginning and that her dreams have come true. Gemma and Aljâz are next to do their show dance – will they pull off the lifts with style in their Cabaret show dance? Now this is brilliant! Light, graceful, nice mix of Quickstep and Samba moves in this, and seriously brilliant costumes in this as well – a true leading lady! Our Score: 10. And that’s how you set the floor on fire! Craig said he liked it but didn’t love it – but liked that she danced outside the box and that it was daring and it showed how she’s grown as a dancer. Darcey said the sassy side of her was really sold tonight and she loved the staging and choreography. Shirley said she was in shock and that she’s graduated from being a beginner in Week 1. Bruno said she was a blonde bombshell and that it was a wonderful Quicksexy! Joe and Katya are next with their show dance – will they have a fairytale ending with their Cinderella inspired dance? Even if Joe doesn’t win this tonight – he has the command and grace of a leading West End man, and that’s where his future is heading to! Such a great mix of dance and entertainment content. A show stopper! Our Score: 10. And may they live happily ever after with the glitterball! So. Eight dances down, four to go. Joe is our winner – who is yours? Leave your comments below and let us know! The jive is still the holy trinity of Ore, Jay and Jill for me. This is good but not that good to be honest. Good hair and costume mind. But needs. More. Flicks. And. Kicks! Our Score: 8. It’ll get 10s anyway because it’s her! I still keep thinking they’re gonna dance to the Fawlty Towers theme when this music starts. Have to say this is better than the first time they did it. Good poise, focus and attack throughout. Our Score: 9. Take me to Buenos Aires, amigos. Bruno said it was sublime and she set the benchmark and did it better than the first time round. Craig said he agrees and that this is a new beginning for her. Darcey said she was stunningly fearless and the finesse and strength of every move was stunning to watch. Shirley said she agrees with everyone else’s comments and that Giovanni’s choreography has really let her shine. We absolutely loved this one when they did it at Blackpool – and it’s a delight to see this one again. So uplifting, moving and graceful, like something out of a movie! Our Score: 10. Everything good is waiting for Gemma after tonight! Craig said it was quiet, simple, classy, elegant and understated – everything Blackpool is not but he loved it (which made Bruno fall off his chair!). Darcey said she should be so proud and that she bought the love of Blackpool back to the final. Shirley said it was a musical extravaganza from a lady who has turned into the most beautiful dancer with the most professional frame. Bruno said this dance was Gemma’s turning point and that she came up in full bloom like a rose – and she’s still going! Light, sprightly and full of wonderful character – it suits the chemistry Joe and Katya have built up together down to a tee. I want some of his energy and enthusiasm. They’re our winners tonight regardless! Our Score: 10. Anything goes with this Charleston – and brilliantly too! Darcey said it was without a doubt one of her favourite dances of the series and that he is a natural dancer who expresses his joy throughout – the perfect end to a great final. Shirley agrees and said this was the way to close the show and that he has pushed the boundaries and now he is completely synchronized and together with Katya. Bruno said it was clever, exciting, original and fantastic. Craig said one word to describe it: FAB. U. LOUS! 10 more minutes before the lines close – have you voted for your favourite yet? So many memorable moments here in this montage! It’s not been a bad one hasn’t it? Time now for Ed Sheeran, performing the UK’s official number one single – and favourite to be Christmas number one – ‘Perfect’, live in the studio. Beautiful single this! Pasha and Karen’s routine is – pardon the pun – perfect for this too! Voting has now closed! Almost time for the last group dance from the Strictly class of 2017…who’s been your favourite this year? ‘I would love to have won but for the one thing I didn’t do – dancing!’ Oh Brian! The Reverend on the cloud again! Loves it! Jonnie’s new hair looks really smart! And can someone remind me why Aston and Janette weren’t finalists? I want to see that again! Hip hip hooray for the Strictly class of 2017! We won’t be live blogging it but we can’t wait for that Strictly Christmas Special! Kimberley Walsh and Pasha will be back! Cannot wait – make sure you don’t miss it, Christmas Day on BBC One at 6:30pm! We’re 7 minutes away from finding out the winner…who is it gonna be? Well deserved winners! Well that is it – just time for me to say a massive, massive THANK YOU to everyone who’s read along with and commented or Tweeted with #StrictlyLiveBlogging this year – it’s been one hell of a ride and we have loved every second of it! Keeeep dancing!